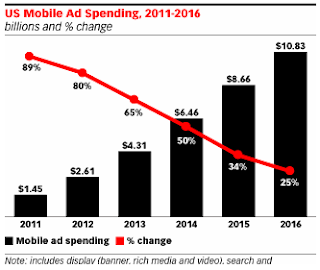 Mobile advertising spending in the U.S. reached $1.45 billion in 2011, an 89 percent increase over 2010 spending of $769.6 million, according to a new eMarketer report. The research firm anticipates nationwide mobile ad spending will grow another 80 percent in 2012, eclipsing $2.6 billion on its way to topping the $8.2 billion mark in 2016. Google raked in 51.7 percent of U.S. mobile ad revenues in 2011, translating to about $750 million, eMarketer states. Apple's iAd follows at $92.4 million, edging past independently owned Millennial Media at $90.9 million. Google also earns an estimated 95 percent of all U.S. mobile search ad revenues. eMarketer anticipates that U.S. mobile search advertising more than doubled in 2011 as spending rose to $652.5 million, up from $253.2 million the previous year. The firm expects advertisers will spend $1.28 billion on mobile search ads in the current year. Google additionally leads its rivals on U.S. mobile display ad spending, earning $127.5 million in 2011 to control 24.8 percent share of the market. Apple accounted for 18 percent of the U.S. mobile display ad market last year, just ahead of Millennial Media at 17.7 percent. eMarketer estimates U.S. mobile display ad spending, including banner and rich media ads, will grow 93.5 percent in 2012 to $861.7 million, up from $445.4 million in 2011. Spending on mobile video advertising will jump an estimated 122 percent to $151.5 million this year, compared to $68.2 million in 2011. Thanks a lot for posting such an informative blog article. Google is surely ruling the mobile markets. Even the Internet Computers Market is being ruled by Google.